Still going with the 30 day coloring challenge! 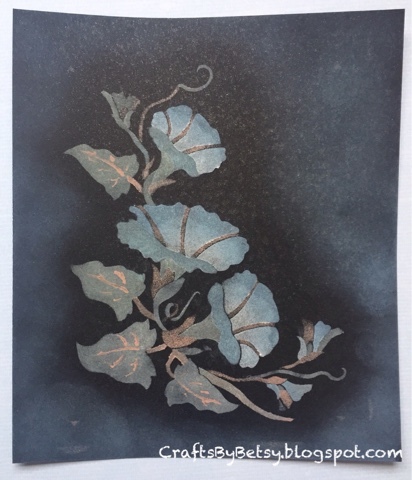 I ran across an old stencil that I had filed away....it's a 3 layer stencil by American Traditional Stencils called CS-9 Morning Glories. 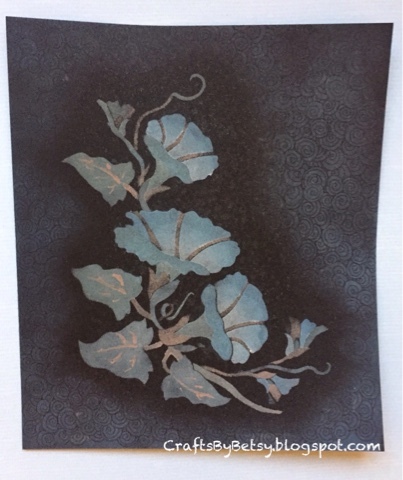 I applied Ranger Distress Oxide and Tsukineko Versa Magic chalk inks to Strathmore Artagain black paper through the stencils with a sponge dauber. I also added some ink lightly around the edges and added pewter Sheer Shimmer Spritz by Tsukineko over the whole piece (the sparkle doesn't show in the photograph). That was day 10 of the challenge and I left it to dry. The next day I added a little tangling with Printemps onto the background with a black Sharpie pen (I was afraid I'd clog up my micron). It's a subtle touch that I'm very happy with. Next I added some depth and color variation with my Cretacolour Aqua monolith woodless pencils (dry). The final layering was adding the piece to an A2 card base and trimming off the edges. The finished card is shown in the first photograph. 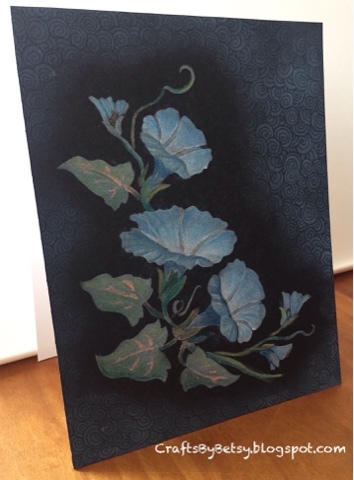 Inspiration for this piece was thanks to a beautiful card on black found here by Heather Telford.